Ouch, this one is tough. The bill and face are entirely hidden in this photograph making a positive identification difficult. What is visible is the arrangement of toes on the left foot of our quiz bird - three toes pointed forward and one pointed back, all on the same level. The fancy ornithological term for this particular toe arrangement is anisodactyl and is characteristic of the passerines or perching birds. So we can say that our quiz bird is a passerine of some sort. We can also see that our quiz bird is yellowish on the breast which eliminates several groups of passerines in one fell swoop: corvids, shrikes, swallows, parids, creepers, nuthatches, wrens, thrushes, thrashers, kinglets, gnatcatchers, pipits, sparrows, and longspurs. Of the warblers with yellow underparts, almost all have the yellow extending to or including the undertail coverts; as noted, the yellow on the underparts of our quiz bird is restricted to the breast with the rest of the underparts being dingy gray or white. Northern Parula has a similar underpart pattern but would be much whiter on the belly. A Yellow-breasted Chat would have a longer, darker tail. The other warblers with a yellow breast and white belly and undertail coverts have streaking on the sides which our bird lacks. How about a meadowlark or Bobolink? Both meadowlarks and Bobolink have streaking on the sides. A flycatcher? The flycatchers that have yellow underparts have yellow on the belly and undertail coverts. Orioles should be longer tailed and have yellow or orange undertail coverts. The same goes for tanagers. A Yellow-headed Blackbird would be a lot darker. A Yellow-throated Vireo would have whiter underparts. Also, though not inconceivable, I don't think you'd see a Yellow-throated Vireo (or a Northern Parula for that matter) landing on a fencepost out in the open. So what does that leave? Well, Dickcissel! 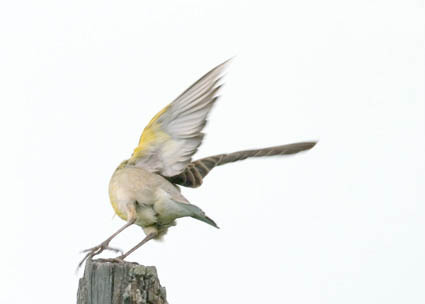 This Dickcissel was photographed by Eric Walters in Knox County Illinois on May 21, 2004. This bird looks like some kind of passerine. The bill is too thick for a warbler, oriole, or even a vireo. None of our sparrows are so plain and green overall. The shape is wrong for a flycatcher. The color is all wrong for a finch, except American Goldfinch, which would show more boldly patterned wings. An American Goldfinch would also be more compact. Female passerina buntings are plain like our quiz bird but would have smaller bills and not be so elongated. The thick, conical bill and long shape look right for a tanager, four of which have been recorded in Illinois. The faint wingbars suggest Western Tanager but a Western Tanager would show contrast between the gray back and greenish head; there is no such contrast on our quiz bird. An Hepatic Tanager would have a darker bill and a dark patch on the ear coverts. A Summer Tanager would be warmer colored and have a longer bill. Also, the wings are probably too dark for a Summer Tanager. That leaves Scarlet Tanager, but what's with the wingbars? Juvenile Scarlet Tanagers do have wingbars and other ages of Scarlet Tanager can have faint wingbars as well. 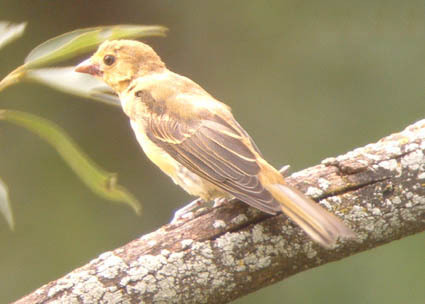 This very young Scarlet Tanager was photographed in Kankakee County Illinois on July 24, 2004. Could this bird be a White-rumped Sandpiper probing for insects in a tree hole? Nope. The graduated tail, pointed tail feathers, and white rump indicate that this bird is a woodpecker of some kind. Red-bellied Woodpecker, Yellow-bellied Sapsucker, and Northern Flicker have a white rump like our quiz bird but those three species have barring on the tail feathers or uppertail coverts. The only other picids with white rumps that occur or have occurred in Illinois are Red-headed Woodpecker and Williamson's Sapsucker. The white secondaries, typical of Red-headed Woodpecker, can just be seen on our quiz bird. 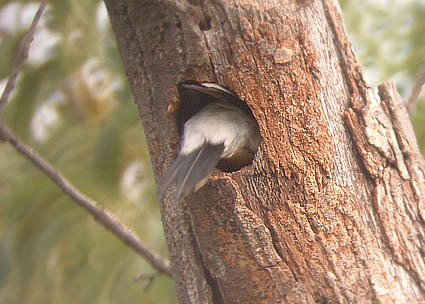 This Red-headed Woodpecker entering its nest was photographed in Kankakee County Illinois on July 24, 2004.